HVAC systems are used in nearly all buildings and operate by drawing air through ductwork, heating or cooling it, and then releasing it into the building. These systems are therefore integral to maintaining interior air quality. Filters found in HVAC systems help to clean the air before it is put into circulation. While filtration can improve human and animal health by removing potentially dangerous microbes and allergens, it is also essential to protecting the ventilation equipment to increase efficiency and longevity. HVAC filters keep particulates from clogging the machine. Failure to use or clean air cleaner filters regularly can result in equipment failure due to hindered airflow. Improperly maintained HVAC filters result in higher energy and repair costs. To avoid these added costs and possible damage, many ventilation systems come with not just one filter, but a series. Though filters are needed at the point of air intake to eliminate build up in the fans and ductwork, several heaters and air conditioners have secondary filters at the air exhaust to further improve air quality. Different types of HVAC filters, which vary in style, size and materials, offer different degrees of filtration resulting in varied levels of air quality. Although filters are found in virtually every HVAC system which are found in virtually every modern building, some industries including medical, biopharmaceutical and food processing use specialized HEPA air filters and ULPA filters which are extremely effective in removing even microscopic particulates. 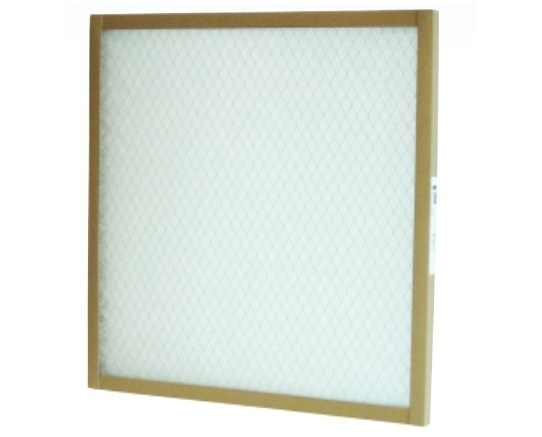 HEPA and ULPA filters are often very expensive and must be cleaned or replaced frequently. Though these types are used in HVAC systems, more common filters used in ventilation include fiberglass filters, polyester media pads and electrostatic filters. The filter panel, which is a physical barrier that allows air but only limited particulates through, varies in construction for each type. Fiberglass is the most common and cost effective type of HVAC filter available. The panel is made of spun fiberglass fibers which create a web-like sheet. Often fiberglass is reinforced with metal mesh before being fitted to a heavy cardboard frame. Polyester filter media pads are similarly constructed, but a combination of fibers such as ceramic, carbon, glass fiber and cotton may be spun with the polyester to increase durability and the reduce porosity letting fewer particulates pass. Frames vary in construction from heavy cardboard to metals such as aluminum. Electrostatic filters, unlike fiberglass and polyester assortments, do more than simply block particulates. In these filters the panel has an electrostatic charged, thus drawing dust and debris to it in addition to blocking it. While some come pre-charged, the air flow over these polypropylene fibers is often enough to create the static charge needed for improved filtration. These filters can also be housed in cardboard or galvanized frames. HVAC Filters HVAC filters are any device used to aid in the purification of air that is moved through heating, ventilating, and air conditioning (HVAC) systems. These filters remove impurities and contaminants such as human skin particles, pet dander, pollen, fabric particles, microbes and bacteria that are common in residential, industrial and commercial environments.